Vortex conical screw blender/dryer are ideal design for vacuum drying with a wide range of applications in both solid and liquid forms, such as powders, pellets, granules, fibers, slurries, pastes and etc. Conical screw vacuum drying blender features of a gentle-action auger screw that gently lifts batch materials updates as batch materials orbit around the wall of conical vessel. Materials being carried to the top of batch then cascade slowly back down into regions opposite the moving auger screw. Meanwhile, the double auger screws rotation and keep the revolution, while the batch materials get a completely and totally mixing result. Thus, the constant exchange of materials between the heated sidewalls and center of the conical screw blenders accelerate the drying process. A common issue in agitated dryers is the risk of product attrition or generation of fines. This concern is well minimized in a conical screw blender/dryer because the blending action is complete and thorough but very low impact. During the drying circle, hot water, thermal oil, or steam is recirculated through the vessel jacket. Due to lower processing temperatures made possible by the vacuum environment, there is a reduced risk of creation hot spots on the vessel walls where products could bake. 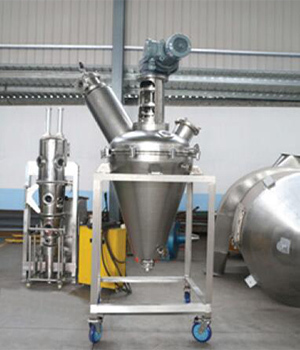 Pictured is 100L jacket-type conical screw blender, both conical vessel and jacket are made of stainless steel 304 polished to 240 grit. Vortex conical screw blender available in many size from 50L through 10000L. As conical screw blender/dryer do not require a bottom support bearing to keep steady so discharge of batch material is virtually 100% complete. This “unsupported screw” design also simplifies cleaning and maintenance. To propose you a suited conical screw blender/dryer, please feel free to contact us via info@incmachine.com with the names and bulk densities of mixing weight, mixing weight for per batch. Our sales engineer would like to send you official offer.